Assuming continued good health, surreal production, and no marketplace adjustments, David Ortiz could have played out the remaining two years of his deal with the Red Sox ($6.5 million this year, $8.4 million next year) and hit the market poised to make more than the $50 million the team guaranteed him yesterday. Why sign, why here, why now? ''I feel this is my house, and I've got to protect this house," said Ortiz, who turned 30 during an offseason that put the team and fan base through a lot. ''This is not all about David Ortiz. This is about the group of guys that play together day by day. Whenever something happens to any of these guys, the whole Nation feels that. ''I can feel that. I can see that. I can see as long as I've been here any time we walk away from a player or a player walks away from us, people feel that. I think our fans, they need to hear some good news, something nice coming through the organization. The past couple of years I think people were just getting annoyed with it. ''I'm pretty sure New England is going to take this as the good news. I want to finish my career as a Red Sox player." That good news, announced on the eve of the home opener: The Red Sox signed Ortiz to a four-year deal (2007-10) at $12.5 million per season, with a club option at $12.5 million for 2011. 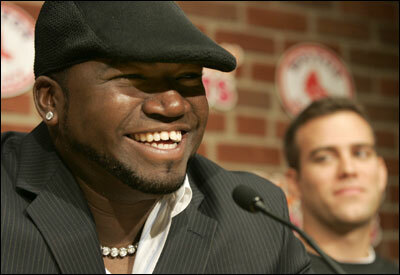 Ortiz, who verified the terms of the deal, will turn 35 the offseason between 2010-11. Though most contracts of this length and heft include a buyout clause if the team does not pick up the option, there is no buyout figure for 2011. And Ortiz's only no-trade provision mirrors the one the club gave Jason Varitek in December 2004; that is, Ortiz cannot be dealt once he reaches eight years of uninterrupted service with the Sox, meaning he can't be dealt without his approval after the 2010 season. However, that clause isn't very meaningful, because his 10-5 rights (10 years of continuous major league service, five with the same team) will kick in during the 2008 season. Once he reaches that status, the Sox can't move him without his approval. But, as of now, it's hard to envision the club ever wanting to move him. In three seasons (and six games) with the Sox, Ortiz has hit .297 with 120 homers, 254 extra-base hits, and a major league-leading 392 RBIs. His extra-base hit total in that span ranks second in the majors, his homer total fourth. He's the only player to finish in the top five in AL MVP voting each of the last three years, during which time he's produced eight walkoff home runs (two in the postseason). ''I can't think of a player who contributes in so many ways," said Sox general manager Theo Epstein. ''David embodies what we want a Red Sox player to be. It was just an easy decision for us that David as a player and David as a person is someone we want to commit to and commit to for a long time." This is the second time in 23 months the Sox have extended Ortiz before his contract expired. In May 2004, with Ortiz making $4.6 million, the Sox signed him to a two-year deal ($5.25 million in '05, $6.5 million in '06), with a third-year club option. They acted early again because they have little money committed long-term (only Varitek, Manny Ramírez, and Craig Hansen had guaranteed major league deals extending beyond 2007), and if they waited, the cost might become prohibitive. Surmised Epstein: ''We didn't think we'd necessarily be able to keep David if he got to free agency." Ortiz would have hit free agency at age 32 and probably would have been in line to sign a deal similar to that which Paul Konerko, 30, signed this winter to stay with the White Sox. He took five years at $60 million, after receiving five-year offers of $62 million (Angels) and $65 million (Baltimore). At a guaranteed $50 million, with the chance to be worth $62.5 million, Ortiz's deal could go down as the richest the current Sox ownership group has given to a player. For now, that distinction belongs to Curt Schilling. Though Schilling signed for three years and $37.5 million, a $2 million World Series bonus and a $13 million option for 2007 that vested with the World Series win have guaranteed him $52.5 million. The Ortiz negotiation began in November, when the Sox approached him about the possibility. According to his agent, Fernando Cuza, the sides spoke again at the winter meetings in early December. In January, Cuza said, he and Ortiz visited with the Sox in Boston. And, over a series of meetings during spring training, the deal, Epstein said, was ''98 percent" done. Yesterday, the signing was considered so significant that owner John W. Henry and chairman Tom Werner sat to Ortiz's right, Epstein and Larry Lucchino to Ortiz's left. ''You don't see the four of us sitting with anybody, ever, except the four of us," Henry remarked. ''I just want to congratulate David, and thank him. When we had our first meeting with David, he told us in such a heartfelt manner how he felt about the city of Boston and how he felt about the ballpark and felt about the organization. In negotiations, we haven't experienced that." The man who shaped that person and player stood off to the side, keeping quiet, often with head bowed. But Ortiz wasn't going to let his father (''Big Papi's papi," as Werner called Enrique Ortiz) go unnoticed. ''That man right there," Ortiz said, ''he saw me playing baseball in the street one time, and he saw me holding my bat, and I remember he came to me and he said, 'Son, if you want to hit lefthanded you're not supposed to hold your bat like that.' "
Ortiz, who'd been swinging lefthanded but with his hands crossed -- his right atop his left -- switched his hand positioning. ''After he told me, I remember I held it the way he wanted me to, and it was easier for me to swing the bat," Ortiz said. ''The other day, we were talking about this [contract], and I told him about that. You know how fathers and sons are. A father can see more than we do, and it's because they experience life. ''He always had that confidence in me, being the father. I remember there were times he would spank me if I didn't do my thing the way I was supposed to. ''He's just happy to be here, to know that things are working out for me."